On September 15, 1910, an unidentified male aeronaut ascended in a balloon from the Willimantic Fair that was being sponsored by the Horseshoe Park Agricultural Association. A gusty wind was blowing at the time, and once aloft the balloon caught fire. 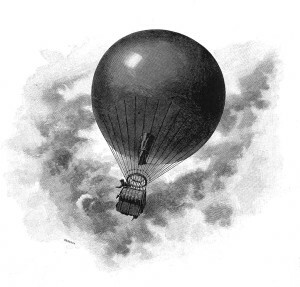 As flames spread rapidly, the aeronaut was forced to jump, grabbing with him three parachutes, one of which was also on fire. The second parachute didn’t open properly, and there evidently wasn’t time to deploy the third. The man plunged into the Willimantic River wrenching his back, but otherwise suffered only minor injuries and was able to swim to shore and walk back to the fair.